In this lesson, we will learn how to describe the paths of light reflected from specular and diffuse surfaces, applying the law of reflection. 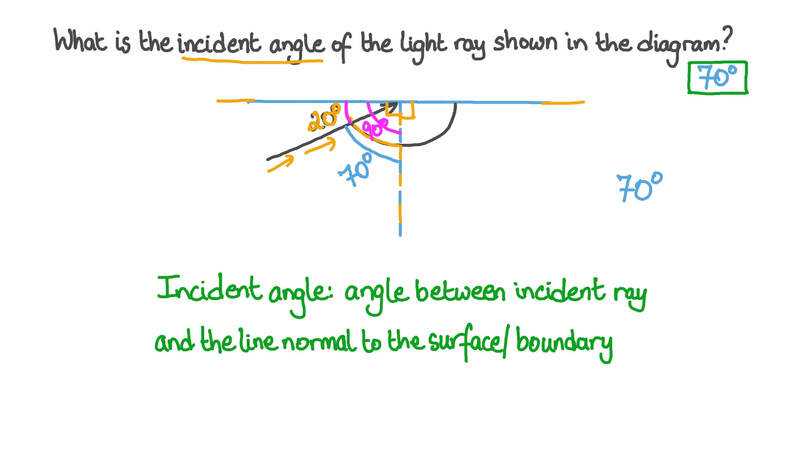 What is the incident angle of the light ray shown in the diagram? A light ray reflects from a mirror, as shown in the diagram. The length 𝐴 𝐵 = 4 c m , the length 𝐵 𝐶 = 4 c m , and the length 𝐶 𝐸 = 5 c m . What is the length 𝐷 𝐸 ? Diffuse reflection involves light rays reflecting from an uneven surface, as shown in the diagram. The diagram shows four points— 𝐷 , 𝐸 , 𝐹 , and 𝐺 —that the three light rays 𝐴 , 𝐵 , and 𝐶 might possibly pass through after being reflected. Which of the points would the light ray 𝐴 pass through? Which of the points would the light ray 𝐵 pass through? Which of the points would the light ray 𝐶 pass through? Diffuse reflection involves light rays reflecting from an uneven surface, as shown in the diagram. The diagram shows three points— 𝐷 , 𝐸 , and 𝐹 —that the three light rays 𝐴 , 𝐵 , and 𝐶 might possibly pass through after being reflected. Specular reflection involves light rays reflecting from an even surface, as shown in the diagram. The diagram shows four points— 𝐷 , 𝐸 , 𝐹 , and 𝐺 —that the three light rays 𝐴 , 𝐵 , and 𝐶 might possibly pass through after being reflected. Specular reflection involves light rays reflecting from an even surface, as shown in the diagram. The diagram shows three points— 𝐷 , 𝐸 , and 𝐹 —that the three light rays 𝐴 , 𝐵 , and 𝐶 might possibly pass through after being reflected. The reflection of an object is seen in a mirror by an observer whose eye is shown in the diagram. At which of the points A, B, C, D, and E is the object’s image seen?